Car shows to pub meets. Regional, National & International. This way you can allready collect any ordered clothing and can also handle the mandatory administrative part (sign paper for insurance, pay fee and pick up road). 4 more confirmations for the "Meet&Greet". The "Meet&greet" is becoming a meeting in the meeting !!! Yep one week to go. Today we are test driving one last time to see if nothing has changed. But it will be a busy week. Tuesday evening along with the cameraman and photographer explore the route to make sure the will be in the rights place to film everything. Next week also go to Zierikzee for a meeting with the technical service to make arrangements for the parking. Thursday evening go to Dimitri De Carlo to pick up the clothes. Saturday explore the route with the"pace cars" and explain the course of the day. All in all that is good for ca 1,500 km that I will spend in the car this week. If you want to join us don't hesitate we have a few place left. We have over 120 confirmed. 5 days to go before the meeting in Zeeland. Important info Zealand Meeting 21/05/2017 !!!! Before the briefing all participants first need to handle the administration : sign paper for insurance, pay 10,-Euro fee and collect road book. This event has really taken blood, sweat and tears to arrange everything, may I ask you therefore to be on time. About the parking at Het Strandhuys, please to park your RCZ backwards (see picture) in order to avoid chaos when we departure. Thanks in advance for your cooperation. I would to thank everybody that join us today for the European RCZ meeting in Zeeland. I also want to thank the people that confirmed but didn't show up today without cancelling. Also Anita Strobants for helping my wife Ann with the registration of the participants during the Meet&Greet and during the the morning at the start of the meeting. I also want to thank Dimitri De Carlo producing some nice polo's and sweater. We reached today to magic number, it was a 3 digit number, we had in total 102 RCZ's !!!!!! That's a que of 500m !!! Pictures and movies will follow soon. Just like to say thank you to Danny and all who helped him to organise the day. This was our first European meet and it was fantastic, we thoroughly enjoyed the weekend in Bergen-Op-Zoom, the people were very friendly and happy to see us. The weather was brilliant too, so the gods shine on us !! 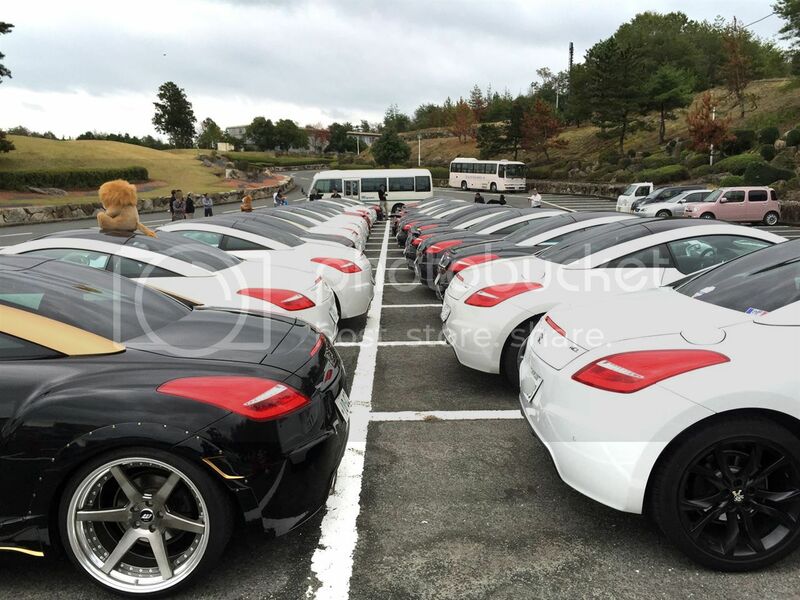 and so they should with 102 RCZ's in attendance. All those who didn't show - you missed a GREAT DAY !! Let's get voting and here's mine... It's a YES from me... Roll on 2018 3rd RCZ European Meet !!! It was very nice to meet you sorry we didn't spook more but I had a very busy day. We will keep in touch for the trip to Austria. End of june I go to Austria to prepare the trip in detail. So beginning of july I will have the complete trip reay and I will come with all the details. I happy you enjoyed the meeting and that you are coming back next year. Just kidding...... but it would be nice!!! No problem re: speaking Dan, I know you were very busy - not a problem. There were so many owners and cars to see, it was like being in a candy shop, just like the very nice one I was in , in Bergen-Op-Zoom !! The drive was fantastic and very scenic, the weather amazing and most of all - the sight of 101 other RCZ's on the road with us. Thanks to Chris for sorting my Satnav upgrade - really appreciated your help - hope you sort the Yuneeq. Thanks to Frank for your hospitality, also Isabelle and her husband + Blint the golden Labrador for their company at the Meet & Greet. The crazy Frenchman Bill 62 and everyone else who took the time to talk with us. All in All a nice friendly bunch. As for Austria... Bring it on!